On paper this seems like yet another beloved childhood property that was resurrected to be artlessly milked. Remember last year’s Beauty and the Beast remake? Nobody would blame you if you don’t. But Christopher Robin made me forget about such insincere intentions. In fact, I was a rubber-faced clown every time Winnie the Pooh uttered one of his simplistic yet profound phrases. If I’m keeping it real, though, he could’ve uttered any banal damn thing and I’d probably lose all sense. The artisanal design of the Hundred Acre Wood animals (resembling old, thread-bare childhood toys who happen to be sentient) and Jim Cummings’ vocal performance as Winnie the Pooh pack a hell of a one-two emotional punch. Cummings, sounding old and worn out and neither quite like a man nor quite like a woman but some ideal combination of the two, imbues Pooh with a fragile kindness that we all wish we had the courage to express. This premise of a sad, middle-aged Christopher Robin reuniting with his boyhood silly old bear pal really does have something to it. The film begins with one last tea party in the Hundred Acre Wood as Christopher Robin is off to boarding school, leaving Pooh and the rest of the wood’s cute little critters behind. Robin promises Pooh that he’ll never forget him. With this in his mind, Pooh waits for Christopher in the falling snow like a faithful pet. Meanwhile, forces outside the young boy’s control – a death in the family, WWII, the passage of time – shape him into an adult whose capacity for joy has shrunk and his childhood memories dimmed. When you’ve seen men die through hails of gunfire and columns of smoke, it becomes difficult to believe that an absent-minded little bear could ever set things right again. When his wife Evelyn (Hayley Atwell) and daughter Madeline (Bronte Carmichael) urge him to join them on a weekend getaway, Christopher Robin opts to stay behind, having been tasked with figuring out a plan to cut costs at the luggage manufacturer he works at. Stressed and depressed, who should appear in Christopher’s backyard but Winnie the Pooh, asking for his help to search for their missing friends. It seems a large fog has descended upon the formerly vibrant Hundred Acre Wood and Winnie can’t locate Eeyore, Piglet, or any of the others. Ewan McGregor gives a carefully calibrated performance as the adult Christopher Robin. He isn’t a sneering killjoy but is driven by his responsibilities and attempts, as best he can, to bridge the gap between himself and his wife and daughter. He reminded me of a passage from the novel Sputnik Sweetheart: “The Earth doesn’t creak and groan its way around the sun just so human beings can have a good time and a bit of a laugh”. This melancholia pervades Christopher Robin, from the Hundred Acre Wood, where the sun shines like it’ll be the golden hour forever, to the gloomy streets of an austere, post-WWII London. If this is all sounds unusually heavy for a live-action Disney movie, well, it is. But only if we’re measuring on a curve. A silly, adorable, and entirely predictable third act involving a ticking clock and some last-minute eureka! moments re-centres Christopher Robin’s askew perspective. Spoilers? No, because c’mon: of course that happens. The silly old bear, with infinite kindness and unconditional love, sets things right in the end, just like he always did in those old A.A Milne stories. 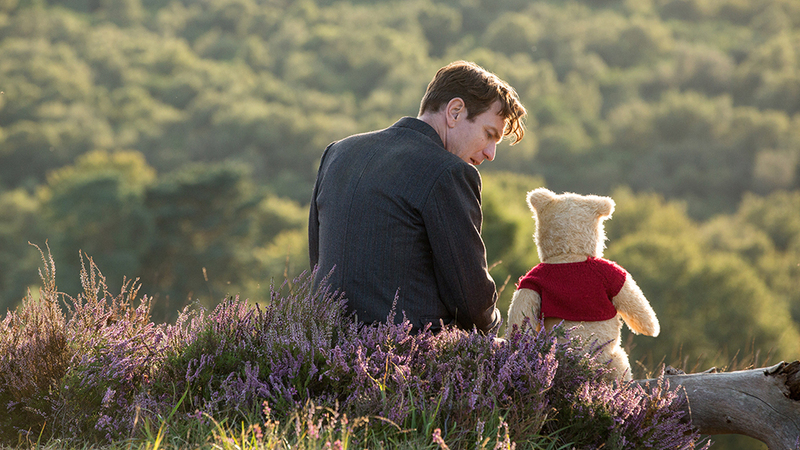 However, it’s to Christopher Robin’s credit that instead of sighing at the predictability of such an ending, I just wished it was true that all it took to lift the fog and make the sun shine again was a hug and a few kind words from a sentient plush. It's sweet.